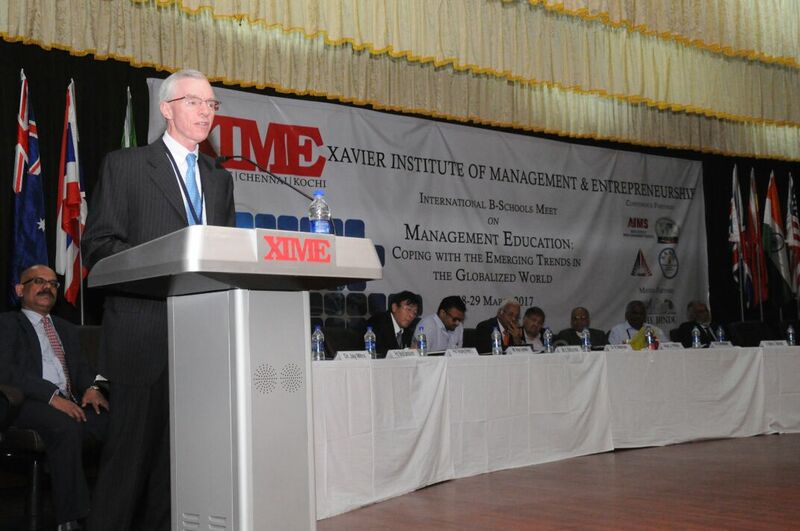 Xavier Institute of Management and Entrepreneurship holds the International B-Schools’ meet with a theme “Management Education: Coping with the emerging trends in the globalized world” which commenced on Tuesday. The two day event ending on March 29, 2017 is being held at the XIME Campus in Electronic City Phase 2, Bengaluru. The conference was chaired by Prof. J. Philip, the Founder and President of XIME. Prof. Philip who is a former Director of Indian Institute of Management (IIM) Bengaluru is considered a doyen of Indian management education and under his stewardship XIME has gone from strength to strength and has been consistently ranked among the best B-Schools of India with the latest Business India Survey putting it at the 25th rank from among over 3500 management institutions in India. “Globalization has been a dominant theme and framework for action for the business world during the last two decades and more. Management education for its part has been making constant adjustments to the exigencies of globalization, whether it is multinational management, business strategy, marketing, international finance or supply chain management,” said Professor Philip. In the backdrop of various concurrent situations around the world, the organizers chose a theme in which they can hold discussions on how management education can cope with various emerging trends in the era of globalization. “There have recently been countervailing forces against globalization, as illustrated by BREXIT, the rise of illiberal populism in parts of the world and policy trends associated with the new USA administration,” said Professor Philip. “While such restrictive trends may periodically appear and disappear, technological developments and the compulsions of inter dependence of nations would continue to shrink the world and make it imperative for businesses to operate on a global canvas. B-Schools too will have to follow suit, and design strategies to sustain their globalized operations and exposure, keeping in view the contextual condition,” he said. A galaxy of illustrious international and Indian academicians along with distinguished industry captains deliberated on the conference theme with separate sessions devoted to the sub themes such as- ‘perils and pleasures of globalized education: stakeholders’ perspectives’, by Dr John Delaney,dean of Kogod School of Business, American University stressed on the U.S. disruption and how it can affect International business school, he says the impediment will shift oportunities from the west . Universities outside the west must collaborate to preserve information essential to recognise we are equal in pursuit of higher education. He also highlighted on pollution as a global enemy . The US policy encourages coal as fuel, this will discourage other countries to reduce pollution. Besides,he also said business is an applied field ,the business school outside the west must lead development and enroll more students from U.S. and Uk .networks and partnerships for globalized education’, funding support for global exposure: requirements and availability’. Other significant and brainstorming sub sessions were ‘globalized education: the role and impact on transnational corporations’, ‘multi-country Programmes: feasibility and impact’, ‘technology enabled pedagogies in management education’ and ‘globalizing management education: An agenda for action’. While Dr. R. Natarajan, the former chairman of The All India Council for Technical Education (AICTE) (AICTE) was the Guest of Honour at the conference, the Keynote addresses were delivered by Dr. John T. Delaney, Dean – Kogod School of Business, American University and Mr. Rajiv C. Lochan, MD & CEO of The Hindu Group. The group of international speakers were the Directors/Deans of leading Business Schools from the USA, China, Russia, UK, Ireland, Malaysia, Thailand, Brazil and Australia and the team of Indian academia was led by the Directors of IIM Bangalore (Dr. G. Raghuram), IIM Raipur (Dr. B.S. Sahay), IIM Trichy (Dr. Praful Agnihotri), MDI Gurgaon (Dr.C.P. Shrimali) and the former Director of IIM Kolkatta (Dr. Shekhar Choudhari). As any deliberation on Management Education is considered incomplete without the industry’s perspective, leading lights like B. Muthuraman (Former MD, Tata Steel), Ganesh Natarajan (Former Chairman, NASSCOM and Chairman 5F World), Sandip Sen (Global CEO, Aegis Ltd), Milind Chalisgaonkar (Founder Mphasis Ltd and Advisor AXA), Amitabh Satyam (Former Managing Partner SAP and Global Consulting Leader – Telecom, IBM) and Suprio Guha Thakurtha (Chief Strategy Officer, The Economist, London) spoke at the event representing the industry.